An eye seems to have popped out on IR imagery. Def a hurricane now. I'd say this is around 70 knots based on microwave de4spite T numbers of 3.0 from IMD, SAB, and JTWC. and IMD says this is only a T 2.5. Vortex (MEGH) over west central Arabian Sea centered near 12.7N 59.2E. Dvorak Intensity: T3.0. Central dense overcast pattern. I'd highly discount the IMD info. That is not a T 3.0. You CANNOT have a T 3.0 with a well defined eye. JTWC only with 60 kt with the apparant eye on IR. 070900Z POSITION NEAR 12.8N 58.7E. IMD upgrades it to a severe cyclonic storm at 09Z. MSW estimated at 55 kt with a Dvorak intensity of T3.5. NotoSans wrote: IMD upgrades it to a severe cyclonic storm at 09Z. MSW estimated at 55 kt with a Dvorak intensity of T3.5. Have they seen the eye? Vortex (MEGH) over west central Arabian Sea centered near 12.7N 58.3E. Dvorak intensity: T3.5. Eye patter (ragged eye). Eye is visible both in visible and infrared imagery. Sometimes I feel like SAB is purposely more conservative outside the ATL/EPAC so they match the JTWC's T numbers more. And IMD can not Dvorak. Eye pattern doesn't start till 4.0, unless they're basing it off of MET (which is dumb). Even PT is like 4.5. Without looking at 15z Dvorak numbers, I'd say this is 85 knots. H. REMARKS...MG EYE EMBEDDED IN LG AND SURROUNDED BY W FOR DT=5.0. 6HR AVG DT=4.9. MET=4.0 WITH PT=4.5. FT IS BASED ON DT. Turns out I'm not crazy then. The mets at IMD don't appear to have a very good handle on tropical cyclones. Dvorak now at 4.5-5.0. This isn't a tropical storm. Vortex (MEGH) over west central Arabian Sea has further organized/intensified and now lays centered at 12.7N 57.9E. Dvorak intensity T4.0 RPT 4.0. Eye pattern (ragged eye). Eye is visible in infrared imagery. at least it will be a very severe cyclonic storm in the next advisory. IMD *finally* upgrades it to a very severe cyclonic storm at 18Z. MSW estimated at 65 kt with a Dvorak intensity of T4.0 (still too low, apparently). Meanwhile, JTWC bumps it to 90 kt. I agree with 90 or 95 kt on that imagery. Where is the IMD's T4.0 coming from? That is definitely a T5.0 with a case possible for T5.5. Given the small size, I would think the pressure is higher than expected - around 970 to 975mb. Dvorak at 4.5 now from India Meteorological Department.. The following is a copy/paste information from the RSMC advisory it may be slightly re-worded..
At 2:30 AM IST, The Very Severe Cyclonic Storm Megh moved westwards with a speed of 21 km/h during past six hours and intensified further. 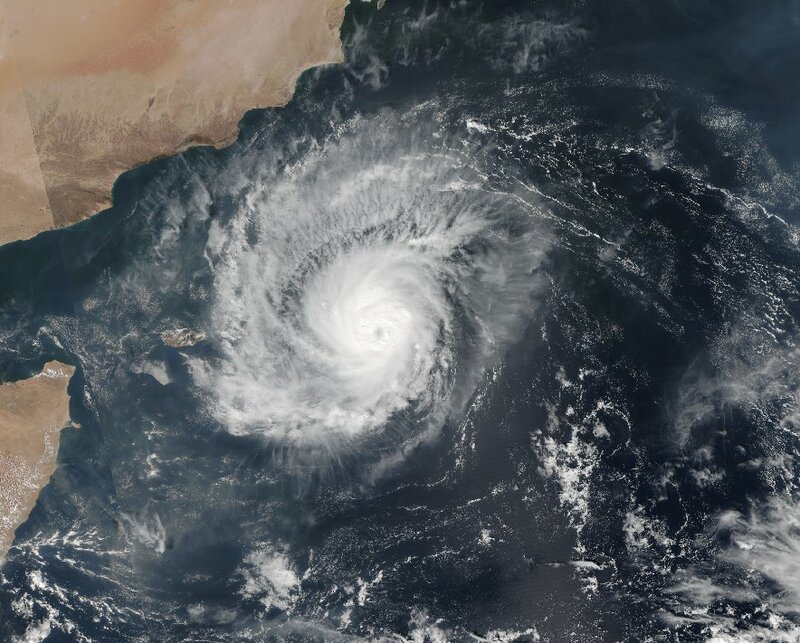 The system now lays centered over west central and adjoining southwest Arabian sea near 12.7N 56.7E, about 300 km east of Socotra Island (41494) (Yemen), 550 km southeast of Salalah (41316) (Oman) and 1860 km west southwest of Mumbai (43003). According to satellite imagery, intensity is T4.5. Associated broken low and medium clouds with embedded intense to very intense convection lie over the area between 11.5N to 14.5N and 55.0E to 58.0E. The convection shows eye pattern. The ragged eye is seen in both visible and infrared imagery. Minimum cloud top temperature in wall cloud region is -83C. sustained winds of 80 knots with gusts of 90 knots. The winds are higher over the northern sector The state of the sea is phenomenal around the center. The estimated central pressure of the cyclonic storm is 976 hPa.